Archiving made easy (and kept local)! FOR THE PHOTO LOVER, FAMILY HISTORIAN, LEGACY SEEKER AND PASSIONATE HUMAN. LIFE IS ABOUT WHAT YOU GATHER FROM IT. Do you need a subtle (yet effective) way to get family members to participate in the archiving process? 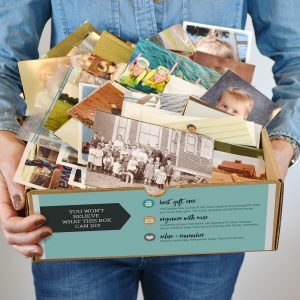 Our take-home, DIY archiving kit simplifies the sometimes daunting task of organizing personal effects and helps get your photo closets, drawers, garages, basements and attics in order! Purchase the box for yourself or a loved one. Inside, find instructions and tips to guide you through the sorting and gathering process. Fill it with memorabilia, photos, slides and home movies, then drop it off at our store. If you have things that won’t fit in the box, bring them along so we can address those items separately. Return to find that everything in your box has been magically transformed into digital format. Now you can relax in confidence knowing those precious relics from the past are now protected and easily accessible. 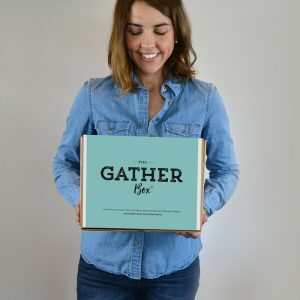 Stop in and purchase The Gather Box from our retail location at 9451 Westport Road – Suite 119, Louisville, Kentucky 40241. We’re happy to ship The Gather Box to you for a small shipping fee. Send your request to us at tk@theprintrefinery.com and we can get one out to you right away. Will my family legacy of photos + movies leave your care? Never! Our team of professional photo archivists will care for your memories as if they were our own. We take memory preservation seriously and that’s why your memorabilia will never be outsourced or sent off site. By keeping your memories local, you are avoiding potential risks like shipping or delivery damage, loss and theft. What if I have memorabilia that won’t fit in the box? Don’t worry, it’s very common for a first time archiver to have more memories than the box can hold. The Gather Box is simply a place to begin. Elements that don’t fit inside the box can be digitized with the same order, however additional fees will apply. We’re happy to work with any size custom archiving project, even if it doesn’t fit in the box! A cost estimate will be provided before the magic begins.